It seems we've reached another low in gaming history. Duke Nukem Forever, that game for which we've been waiting forever, released a new trailer... where Duke throws faeces. That's right, as part of the promotion material for the game, the developers thought it would be fun and encourage people to buy the game by demonstrating that you could throw faeces and that Duke would comment about it. Really? Are games that lacking in creativity that they need to resort to that kind of advertising in order to gain attention? Sure, the "Your Mom Hates Dead Space 2" campaign was bad enough, but now we're forced to endure garbage like this? Surely games as a medium have more credibility than that? Let's just consider the history of Duke Nukem for a moment to realise how stupid this truly is. You just flushed your credibility down the toilet. Duke Nukem 3D was released in 1996, and was rated 18+ in most countries. Even if we consider that the youngest players might have been around 10 years old when it came out, those same people would be 25 years old now. Do the developers honestly think that this kind of toilet humour is going to win over a faithful audience of 25 years or older? If we're going by people who were legally allowed to buy the game when it came out, they are now 33 (or 30 in Australia) years old. To me, this video is a prime example of the kind of hideous mis-steps that developers, publishers and marketing teams are making when creating games. 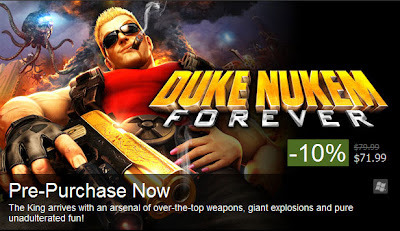 I, for one, will not even remotely consider a pre-order of Duke Nukem Forever now because of this video. In fact, I imagine that I'll probably wait until it drops significantly in price before I bother buying it, even if the reviews are overwhelmingly positive. How can I expect to be treated to a fun and witty gaming experience if this is what was chosen as "good advertising material"? Of course, I can't let this pass without lambasting IGN for their comment when posting this video... "The insane shooter game Duke Nukem Forever may have a Mature rating, but this trailer shows the fun things you can do with poop." There you go, IGN approves of this marketing and declares this gameplay to be "fun". Neither "absolutely disgraceful" nor "utterly shameful" come close to accurately describing the situation. Perhaps they are trying to capitalise on a different market? Maybe we need more promotional material like the brand-new super-exciting, put-you-on-the-edge-of-your-seat, "No-way!-It's-going-to-be-the-best-game-ever!" trailer for Modern Warfare 3. I loved MW1, thought MW2 was a serious step backwards, and based on the trailer, I'd say that MW3 looks set to continue that downhill trend. Given the incredible hype, I almost wondered if I'd watched a different trailer. All I saw was something that looked like it was trying to imitate the "non-stop action" and "cinematic excitement" of something like Michael Bay's Transformers: Revenge of the Fallen. The methodology appeared to be to cram as many famous landmarks as possible in the video and blow them up or have exploding vehicles near them and watch the fans go crazy. MW3: Has a higher protagonist death toll than ever before! Yes, I'll admit that I'm exaggerating (though only slightly) to demonstrate a point, but I feel it's something that simply doesn't seem to be gaining much credence in the biggest AAA franchises. As someone who loves video games I'm ashamed by the large number of developers selling big name titles that resort to this ridiculous over the top attitude, cheap-tactic marketing campaigns, or purile attempts at humour in order to get attention. What worries me more is that in many cases it seems to be working. The frenzy over the MW3 trailer was phenomenal, and the Duke Nukem juggernaut appears unstoppable riding on over a decade of "Are we there yet?" waiting. Where are the intelligent advertising campaigns? Where are the games that are actually trying to be bigger and better rather than simply trying to break a new "explosions per minute of gameplay" record? Where are the games that are actually trying to be funny instead of making bad attempts at toilet humour? They're out there, certainly, but they're overshadowed at times by uninspiring material like these two examples. More importantly, why is the gaming population pandering to such behaviour? Why are we not telling publishers "we deserve better" when terrible marketing campaigns (or games) are shoved in our faces? Or am I as a gamer that far removed from the pulse of the general public that I no longer accurately represent that biggest market segment that publishers are trying to get to buy their product? There have been some truly great gaming titles that not only provide some fantastic gaming experiences, but also give us something to think about long after we've put the controller down. We've played games that have given us amusing quotes or lines just as powerful as any book, movie or tv show. Gamers have grown up. Games have grown up. Can't advertisers and developers get on-board and deliver the type of experience that our favourite entertainment medium deserves? Recently I was involved in a discussion regarding cheating in games. During this discussion, one player declared themselves to be the equivalent of the game developers, thus the arbiter of all rules within a game, and consequently assumed that using console commands to do things like giving themselves extra gold was not cheating. While there was little point in belaboring the issue, it did raise an interesting question for me about the nature of modding official adventures from game developers. The question is: at what point do mods become cheats? 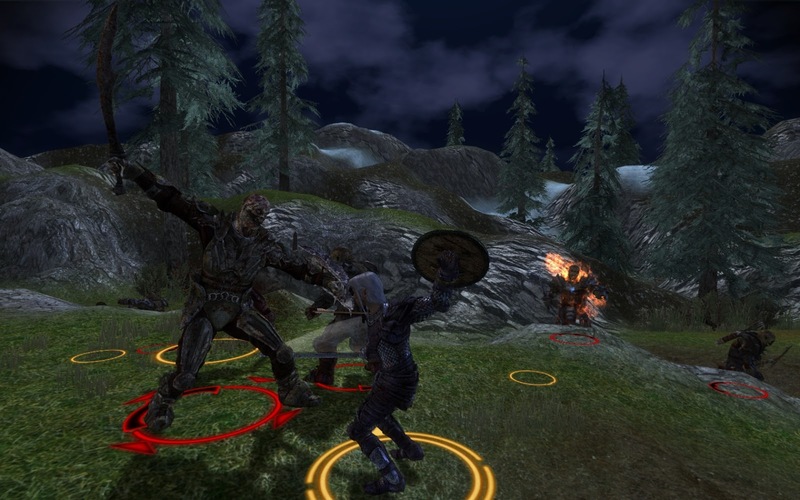 In Dragon Age or Oblivion, it is a "simple" matter to include additional content in the main single player campaign or to even modify the mechanics of the game. Adding extra quests, weapons or armor, new creatures, changing creature AI, or even abilities and levelling curves are all possible. All these things result in a different experience than was created by the developers of the game, so at what point are we considered to have "cheated" by using these mods? If someone pulls down a console window and gives themselves an extra 50 gold, almost anyone would call it a cheat. But say the player installs a mod with a large and expansive quest line, and by the end of completing that quest line, they've gained 50 gold, not to mention a bucketload of experience. Is this cheating? The end result is the same, in that it has the same (or at least similar) effect on the character as far as the "original" game is concerned, but in the latter case the player has had to "work" for their benefit rather than receiving it instantly via a console command. Is Alley of Murders a cheat? 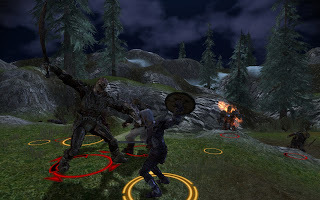 In both Dragon Age and Oblivion, gaining extra experience is not as much as an issue due to their level scaling of enemies (I've already discussed the pros and cons of that, so let's not cover old ground), but the additional resources of gold the player gains may allow them to buy additional equipment that would make them more powerful that they should be as part of the normal course of the game. I'm also forced to think about a mod I installed on repeat playthrough of Oblivion that changed the levelling and skill system. Instead of magically levelling up and selecting attributes to level based upon which skills you levelled during your adventures, your attributes and levels dynamically rose in the wild, just like your skills do. Upon raising your level in a particular skill, the relevant attribute would be raised by an appropriate (fractional) value and would increment a value that was used to determine your current level. You could customise both the amount each skill contributed to your attributes and level, such that it was possible to implement a balance that effectively mimicked the original levelling system in the game without potential desire/need to metagame skill advancement to facilitate attribute increases. To be honest, I found it a far more useful system that allowed the player to play freely without worrying that the game would become extremely difficult at later levels had they not done some metagaming to increase their attributes by significant amounts for at least part of the game. This playthrough followed a similar difficulty curve to my first playthrough, yet I found myself liking the modded levelling system a lot more than Bethesda's because it felt more immersive by taking away the arbitrary "you levelled up so now get to increase your attributes based on what you did". So given the experience was more or less the same as an unmodded playthrough, could it still be considered cheating? At what point do mods become "cheats", and at what point does that matter in being able to make objective judgements or reviews on the game that players are given by developers or modders? While there is still much work to be done for the Shattered War, there are certain areas where I have made significant progress towards completion. One of these areas is the writing of dialogue, as a large portion of the main plot has been written. As a result I have put out my first call for voice actors for some of the parts for the mod. This only represents a small section of the adventure - there are many more roles (both male and female) still left to cast, but I thought I would attempt to cast roles in an ongoing fashion rather than having an open slate for every single character in the mod. I realise that the female roles in this initial audition are very limited, but rest assured there are a numerous important female characters that I have still yet to cast. However, as of yet, the response has been very limited, as evidence by the post having dropped back several pages on the forum as of the time of writing. So I'm asking for your help, dear readers. If you are interested in voice acting, know someone who may be interested in voice acting, or even know of somewhere else I should look for more voice actors, please let me know. I have a sizable cast to fill, so if any readers are able to render assistance in any form, I would greatly appreciate it. Helping me find voice actors will help me deliver a more polished and engaging adventure for you, and I want to make sure that adventure is of the high quality possible. The Shattered War places you in the Frostback Mountains, as a member of the militia of Fort Velen. This is a Ferelden militia, sent to investigate rumours of darkspawn attacks in the region. As a respected officer and capable soldier, you are given the important task of finding out whether this threat is real. All too soon, you find yourself in the midst of danger, and realise that the rumours are all too true. 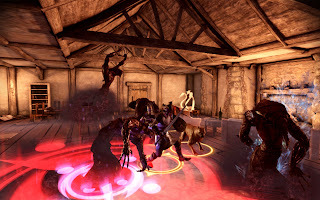 Yet you are not without allies, for the campaign against the darkspawn sees the formation of an uneasy alliance between Ferelden and Orlesian troops. The templars also have a presence at Fort Velen, though their leader's hard stance towards mages results in its own tensions within the ranks of the warriors. Even a Grey Warden seeks to join the fight to uncover the nature of the threat in the region. Fort Velen is not an impenetrable stronghold, but as home to these brave warriors, it is the sole bastion of hope within the Frostbacks as towns, villages and travelers all live in fear of the growing darkspawn threat. It falls to you to lead the efforts to rescue the people of the region, to restore the towns such that they might be able to fend off the attack that they will inevitably face. But signs point to a more sinister force at work, someone aiding the darkspawn to bring chaos and death. Amidst such rumours the shadow of betrayal looms to cast a light of uncertainty on shaky allegiances, and you must become the leader who will make the difficult decisions needed to stop a slaughter. 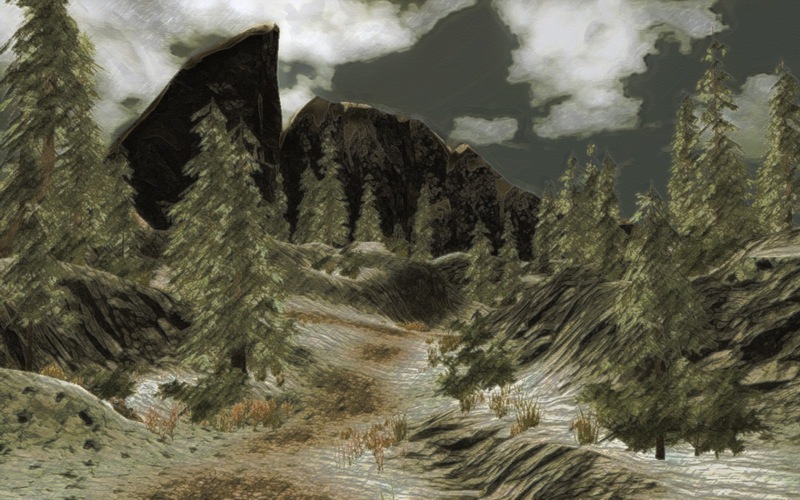 An artist's impression of Frostback Peak. Will it claim your life? The Frostback Mountains, so often shrouded in snow and fog, now hide secrets that could bring a war to both Ferelden and Orlais that will shatter a short-lived peace. Will you be named hero or villain once your part is complete in The Shattered War? Buying games isn't what it used to be. This isn't some nostalgia driven wish for the return of the "good old days" when we used to have PC speaker bleeps for sounds or low resolution images where our mind filled in the blanks. I'm talking about going into a shop and getting our hands on a game we want to play. That aspect of gaming no longer has the appeal it once used to have. To demonstrate what I mean, I'm going to showcase the physical packages from two different games: Baldur's Gate and Dragon Age 2. The first thing the player sees is the box. The Baldur's Gate series was metaphorically book-ended with narration, as though it were a written tale being told. 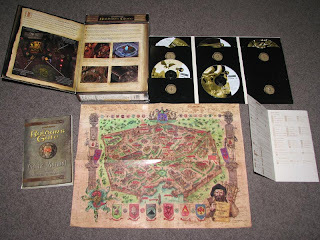 To this end, even the box that the game comes in supports this metaphor, with a cover flap that the player can open, and one side (and the top and bottom) of the box having art indicating a thick leaf of pages between the two covers on the front and back of the box. 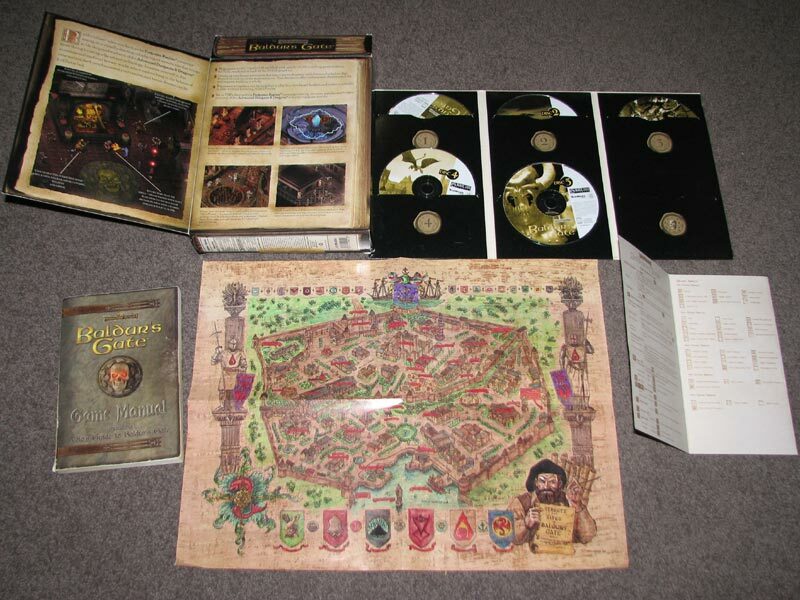 There's a double sided map, one showing the city of Baldur's Gate, the other showing the wilderness of the Sword Coast in which the game is set. There's a quick reference card identifying various commands, icons and effects. 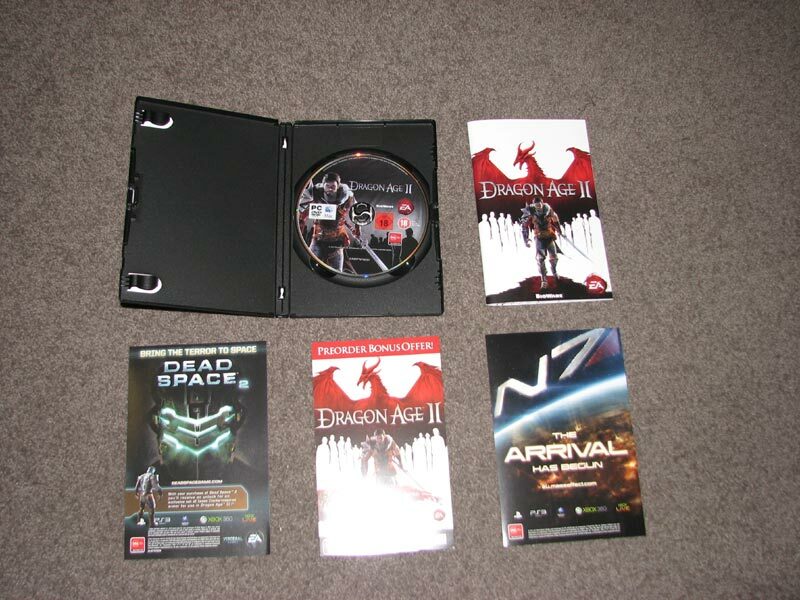 The 5 CDs on which the game came were each printed with CG images taken from the pre-renders developed for the game, all in a nice folding covering matching the motif of the outside box. Finally we have the manual, weighing in at 160 pages, providing the basics required to play the game (approx 30 pages), around background and setting information (around 30 pages), and then details of the rules and mechanics behind the D&D mechanics used by the game (approx 90 pages). The remaining 10 pages are index, credits, etc. When you bought the physical game box, you got more than the game. The whole experience of the game started with the box and everything inside. Everything supported the experience that the game was attempting to give the player, and you really felt as though loving effort had gone into every aspect of its creation. If we compare this to modern gaming counterparts, the difference is very stark indeed. What a contrast! We get a jewel case with slightly fancy artwork; it has a black cover instead of white like the manual (with the silhouetted people being likewise inverted), and a silver dragon instead of red. 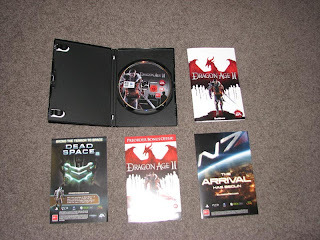 It comes with three cards: one of which is purely advertising for Dead Space 2 and Bulletstorm, another with the codes for two pre-order bonus items, and then a third which serves as the codes for the Signature Edition content as well as advertising for the Mass Effect 2 DLC "Arrival". The manual has a paltry 40 pages (and that is fairly large by modern standards) and provides only basic information on how to play the game and its mechanics. That's it. Now, maybe this is all we can expect from our games these days because gamers don't care and thus are happy to just download a digital copy of the game. Or is it that gamers don't care about physical copies of games because this is all we get? Which came first, the chicken or the empty game box? I remember getting stickers with the game Zool, a slew of journal entries of events from the game (and some that didn't exist) with gold box games, and even a keyring with the original Dungeon Siege. Purchasing a game was more than just buying the game disk(s) in a case, you were buying into the experience that the game offered from the moment you opened the box. The commercialization means that it's no longer an experience for the player, it's a franchise to be showcased, advertised and hyped as a world-wide phenomenon to attract more people to the ever-growing behemoth. This isn't to say that I'm unhappy about the increased popularity and acceptance of gaming within mainstream society. I love the fact that playing video games no longer carries the social stigma it once did - sure, it's still there to some degree, but gaming is gaining credence as an acceptable past-time and its popularity keeps rising. It seems that now games are now just another form of entertainment, placed next to a DVD/Blu-ray/CD and simply used in their immediate form. Why would a publisher spend money on a manual that very few players will bother to look at? Most players won't care about seeing a map of a game location included, nor would they contemplate using a new keyring that bears some motif from the game. Those players who do can buy them from the merchandise store. It seems that in this case the "good old days" are gone for good, and I lament their loss. That we as a wider audience cannot appreciate the effort, creativity and indeed artistry that goes into so many elements of creating the form of entertainment that so many of us love is regrettable. Perhaps even more so that those of us who choose to do so in all likelihood don't end up directly benefiting the wonderful creators of that artistry, but instead hand over much of our money to the controllers of the franchise. So next time you buy a game, think about what you're getting in addition to the disc you bought. Consider the effort and art that went into it, and spare a thought for the days when you got to share in a little bit of that of that creativity when you went to your store and brought home a gaming experience as opposed to just a jewel case and printed game disc that truly feels like part of the mechanical production line it came from. Some readers might be aware of the gross inequities in computer game pricing across different countries. Coming from Australia, I've been used to paying around an extra 1/3 on top of US counterparts due to the relative value of the two currencies. However, over the past couple of years, that difference has disappeared, yet Australians are still forced to pay the same premium for their games. The evolution of digital distribution should have surely solved these issues, as the distribution can be centralised and thus cost the same regardless of where the player is coming from. The market leader in this area (at least for the PC) would have to be Steam. The developer/publisher gets a great advantage here as they can just take advantage of Steam's existing network for limited additional cost. Yet even via Steam, there are vast difference between the price I pay in Australia and the price someone pays in the US. The fantastic website http://www.steamprices.com/ can quickly demonstrate some of the regional differences (both rip-offs and bargains) in Steam pricing. Let's keep in mind that as of writing, the current exchange rate is $1 Aus = $1.0655 US. High prices? Take it, baby. This is a digital distribution medium, so there shouldn't be a significant difference in price. The differences here are largely made by publishers to appease distributors who send out boxed copies of the game. Steam/Valve is not the one who sets the prices for individual regions - they're just taking their cues from the company that gave it to them. These boxed copies obviously present additional costs to the supplier and the retailers, and then you've got the mark up from retailers themselves to pay for store space, staff wages, etc. Obviously we'd expect those prices to go up a little from a digital distribution. Well, let's consider actual boxed games here as well, as they are priced direct from a retail stores. While I was recently in Singapore, I did a quick scout of a few games, so I could do a comparison of prices of boxed PC games. I'll give a range for the PC games here, as I've seen multiple prices across different retailers. By comparison the few stores in Singapore I was were fairly constant. The exchange rate in this case is $1 Aus = $1.3204 Singapore. Also note that Singapore is very harsh on software pirating, and hence all these are legitimate copies of the software, unlike some other countries you might visit in the Southeast Asia region. The first thing to note is that Singaporeans are actually getting a darn good deal here. Given how immensely cheap it is to buy games there, and that it's a relatively short hop from Singapore to Australia, why is their such an exorbitant mark up on so many games here in Australia? The short answer to that question is "because the sellers can get away with it." People still buy games are their over-inflated prices, because people were willing to pay those prices when the exchange rate was far less favourable. Even worse is that many of these games are upped in price as they approach (or reach) their release date. 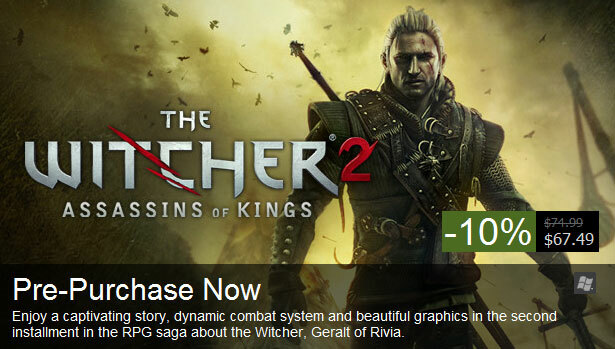 Witcher 2 and Brink are two recent examples that had massive price jumps for Australian customers. This means that if you're in Australia, you're likely to pay significantly more for a game unless you pre-order the game. If you want to pay an equitable price compared to your overseas counterparts, you have to make the leap and purchase before you've read any reviews of the completed product. 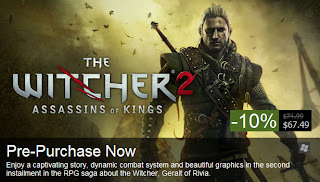 I should note here that the developers/publishers of The Witcher 2 are trying to do the right thing by Australian customers, and are offereing credit at their online store http://www.gog.com/ to offset the increased price of the game. I applaud this move, but they shouldn't be forced to have to do this in the first place! Players can benefit from cheaper (and fairer) prices if they're willing to wait or order from overseas, but this doesn't really do anything active to stop the issue from occurring in the first place. Why should gamers pay such significantly different prices for exactly the same product? More importantly, how can gamers from all countries make their voice heard to raise the issue of game pricing and strive to make everyone pay an equitable amount? It's about time that this kind of behaviour stopped. It's about time that companies stopped gouging players with exorbitant prices. I would be happy to walk into and support my local store if I wasn't paying a $30-50 premium for that privilege. I love games and I love game companies, and I likely to treat them fairly by buying their games and giving them respect (or derision) based on their individual merits. I'm asking publishers to treat their customers with the same respect. To this end, I have one simple request: Don't rip us off. Having come back from my break, I've started modding again for The Shattered War. I decided to get back into the enjoyable task of level design, working on one of the wilderness areas high in the Frostback Mountains. I thought I'd done a moderate amount of work and there'd be some basic sculpting and then it'd be the lengthy process of decoration with props and vegetation. Taking a break from something and then coming back to it later is a great way to spot the faults in a level. I hadn't realised just how much work that the level needed in terms of additional sculpting to bring it up to an acceptable level. On reflection the level had been done quite some time ago as a basic draft to get the shape of the level and see if the basic concept worked, but somehow along the way I'd decided that it might not have needed too much work. A quick look told me this was most certainly not the case. Now, I hadn't touched this level in quite some time, and the draft was done up in a matter of maybe 4-6 hours. However, while the rough shape was done, after some closer examination I realised that the terrain needed to be tesselated to a far greater degree in order to give a proper organic look that I would expect. Now, while there's some degree of sharp and jagged edges that you can "cover up" using props and vegetation, I realised that wasn't an option in this case. If I'm to give a sense of perspective, the narrowest section is about two-to-three people wide, and the low-outcropping is slightly higher than the height of a human. As such, those very angular edges would be extremely up close and personal to anyone walking through that section of the level. So I undertook a fairly serious resculpting of the level, fixed jagged edges, abrupt angles and anything else that simply looked abnormal. Even now I could probably increase the tesselation another level in large patches of the level, but issues with the lightmapper in the DAO toolset mean that this is likely to cause insightly black spots due to some errors in the way it precalculates lighting effects. There's always a trade-off between effort and aesthetics, so I felt I was able to strike a reasonable middle ground with the reworks I've made thus far. I even managed to get some of the vegetation in for the level, though I've kept it clear from this picture to give a clearer difference shot between before and after. 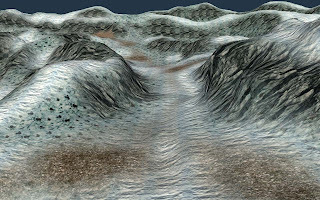 It's still not a perfect look by any means, and there's still some softening and adjustment I'd like to do, but overall there's a lot more rounded terrain and less obvious triangles sticking out from the edges of the landscape. A little more effort is still needed here to give more character and variance, even though most players probably won't pay that much attention to this small part of the level. As a side area, this level was unlikely to ever give the player a "wow" moment that would make them gawk at the gorgeous landscape. However, I could not let it pass without still giving the player a sense of the brutal but beautiful landscape of the Frostback Mountains. Sharp triangles are hard to soften with vegetation, but that area (and the entire level) is now a lot easier to make look like authentic terrain by using a health dose of grass, shrubs and trees. The more interest you can create with the base mesh of a level, the better the level will look once it is fully decorated and populated with everything else that ultimately brings it to life in the game. For those who haven't finished Dragon Age 2, you may want to tune out now. 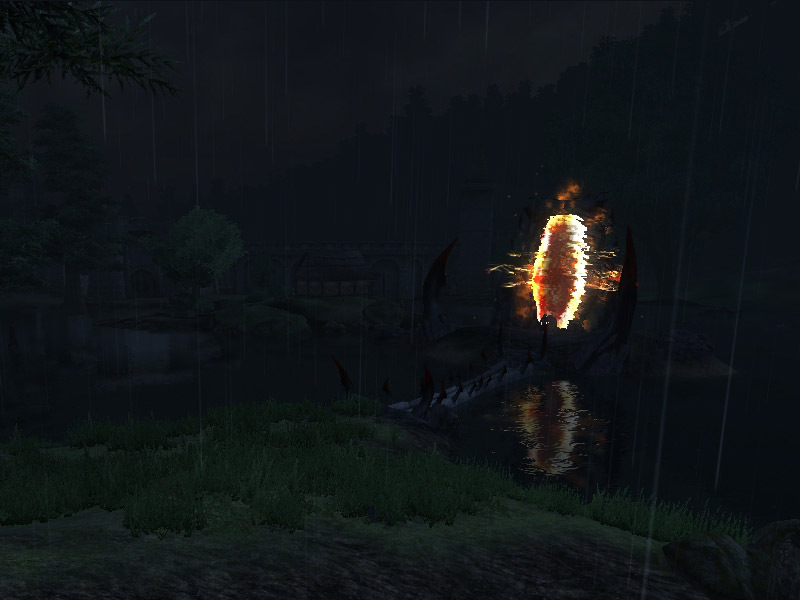 I'm going to give some fairly significant spoilers about some events within the game that some may not wish to hear. If you've finished the game, or don't care, then by all means keep reading. Dragon Age 2 is not a game without flaws. In fact, it's got some pretty glaring ones at times, but on the whole I still found it a very enjoyable experience because I felt that it was a well crafted series of events where your decisions are actually had an effect on the outcome of the game and the lives of the characters you encountered. This was one thing that was pushed by BioWare in Dragon Age: Origins, and they reinforced that those decisions would matter with the "import" function they included to allow your decisions to carry over from that game into the sequel. However, where this came crashing down horribly was the handling of one character: Leliana. Apparently the love for the red-haired bard from the original was so great that BioWare felt like bringing her back... even if you killed her in the first game. Leliana appears in the game a few times in what is little more than a cameo appearance, yet somehow the writers felt that this justified her being alive. "Because the option was there as a reaction to your choice to defile the Urn of Sacred Ashes... not as a "you will never have to deal with this character again". We're not saying what happened in that chamber never occurred... in fact, we're not saying anything yet, with regards to Leliana. You're free to make all the assumptions you like, of course, but if what you're insisting on is "I think X is dead so I should never see them again no matter what"... well, prepare to be disappointed. What happens isn't always going to be what you think should happen. It will, in fact, pretty much always work out the way we think it should-- and that includes bringing characters we like back. For those people who are just going to stamp their feet and insist that it should be what they want instead, I can guarantee that there's no amount of explanation that will convince them it isn't some offense to their idea of how our universe should work..."
Unfortunately, I couldn't disagree more with this line of thinking. Maybe we'll get to see what the "master plan" is when Dragon Age 3 is inevitably released, but what possible cause is there for Leliana to be so vital to the plot that her role couldn't be filled by another character? Her persona appears to have changed from how she was represented in Dragon Age: Origins and even its DLC Leliana's Song, so why bother "reincarnating" her? 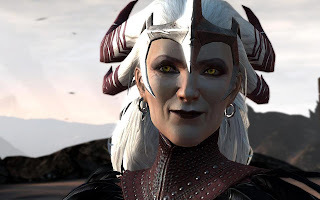 Admittedly, Flemeth is brought back regardless of whether she is killed in Origins, but at least she has a legitimate excuse and is a crafty old crone who had planned it from the start. As a powerful character within the Dragon Age lore, it's also potentially justified in terms of her impact on the world. It makes sense given the scope of what the player has been presented. But Leliana has no such justification for the treatment she is given, and while it might potentially be presented in the third game, players should not be left with such a huge gaping piece of the puzzle missing when BioWare are effectively breaking the contract they have made with the players: "Your decisions matter." If the player makes the decision to kill someone, they should stay dead. If they do not, then the player must be given a very clear and tangible reason why this is not the case. Flemeth has that, Leliana does not. Now, I realise it could be said I'm speaking with somewhat of a sense of entitlement here, as Dragon Age is not a story that I have written. David Gaider and other writers have mentioned this concept before, in that some players have a sense of entitlement that they think the game should turn out exactly the way they want it to. Unforunately, this isn't exactly one of those cases. The writers have given us an option: to kill off a character. However, the subsequent writing has stripped the players of that decision. Dragon Age may not be written by the players, but they are making their version of that story by playing the game. By stripping players of their version of the story, the artificial nature of the reality presented to us is exposed in one of the harshest ways possible. Effectively the players are being told "No. You did a bad thing that we don't want to happen, so we're not going to rewrite your reality and say that didn't happen." Limiting a player's options by not allowing them to take a particular action is a necessity of video games. No development team can cater for every possible action that the player might wish to do and make all actions possible. If you're playing a Call of Duty game, you can't find a Samurai sword and start decapitating people. In Grand Theft Auto you can't weld two assault rifles to your car and shoot them while driving. There are a limited number of ways to interact with a game, and players expect that. However, when you give a player a means to interact with the world, then later ignore all consequences or results of that interaction, the player feels cheated. Unfortunately, this left a bitter note at the end of Dragon Age 2 for me. Knowing that choices had been taken away from me and that there was nothing I could do about it. Then again, potentially in Dragon Age: Awakening Anders could die and Justice might never survive... which destroys so much of Dragon Age 2 that it isn't funny. As a closing remark, I should say that in my one full playthrough of Origins/Awakening that I didn't do any of these things: The Warden romanced Leliana, Anders survived, as did Justice. But I potentially could make alternate decisions. Knowing that those decisions wouldn't be respected effectively ruins the whole point of being able to make them and import them into the second game in the first place. Funnily enough, the solution would be as simple as "Don't allow an import". This makes each game their own self-contained adventure and leaves the writers free to write whatever they wish. Players might complain that it's not giving them the same option as BioWare's other flagship game series, Mass Effect, but if the writers never make the "promise" that the player's decisions will be carried over to the sequel, the players can't expect them to do so.